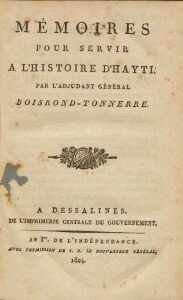 Although originally published in 1804 in Dessalines (then capital of Hayti), it is with their second edition by Saint-Remy (Paris, 1851), that Boisrond-Tonnerre’s Mémoires were passed on to posterity. 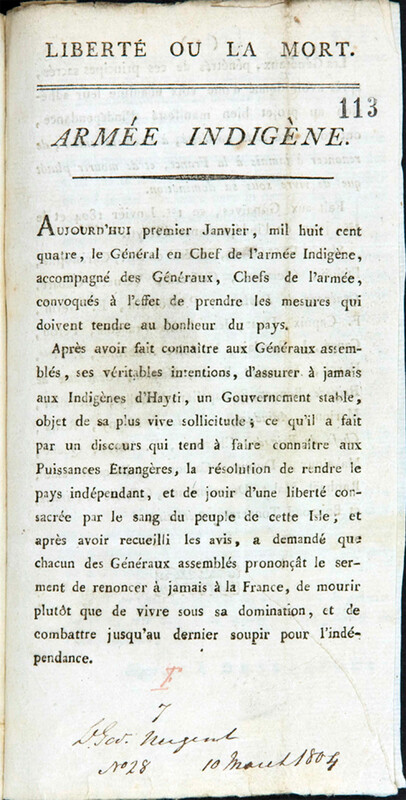 Until recently, misled by Saint-Remy’s remarks on the rarity of the book and his difficulties in tracing a single copy in good condition in the 1840s, it was generally incorrectly assumed that the original edition was no longer available, or perhaps never even existed as Raphaël Berrou and Pradel Pompilus claimed in their Manuel d’histoire de la littérature haïtienne. Decades later, it was also Marlene Daut’s first conclusion as she states in an article on Boisrond-Tonnerre and de Vastey: “I have not been able to find an original copy of the 1804 text in any libraries in the U.S., France or Haiti. This caused me to momentarily question whether or not the memoir was published at all before 1851”. 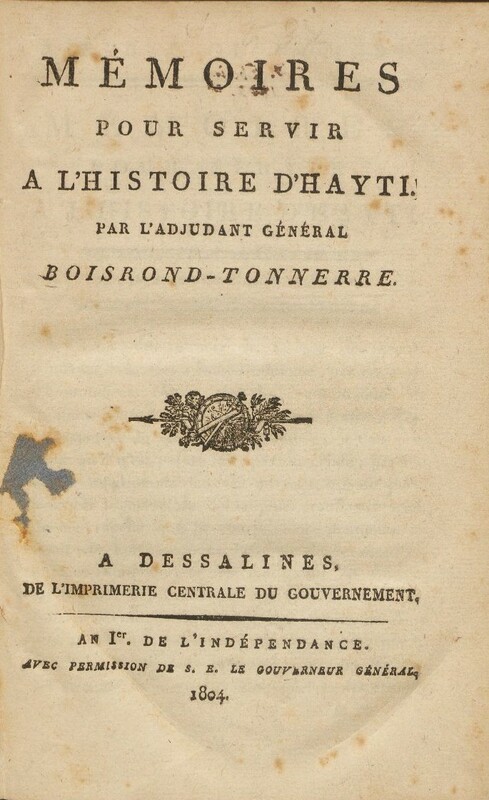 Yet Saint-Remy, in his “historical and critical study” of Boisrond-Tonnerre’s text, explicitly refers to the edition of 1804, and Beaubrun Ardouin in volume 6 of Études sur l’histoire d’Haïti states that the Memoirs were “written and published in 1804”. In addition, the 1804 first edition is listed in the Catalogue of the Harvard University Library in Cambridge, Massachusetts, at least since 1830 (vol. 1, 85). This gift of Colonel Israel Thorndike (1755-1832), according to Harvard reference librarian, Susan Halpert, based on a note in William Bentinck-Smith’s Building a Great Library: The Coolidge Years at Harvard, most likely dates from 1818. 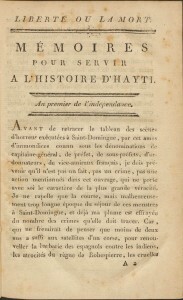 If the Dessalines edition is now online, it is primarily because Henri Cauvin and Nicole Xavier Cauvin in 1987 had published a third edition of the Memoirs, which, except for some typos or omissions, carefully followed the 1804 text, even reproducing word for word its front cover. This self-published book went unnoticed. But after I read it in August 2011, I knew there was a copy of the first edition still available. I decided to go to the source. Thanks to such modern research tools as online catalogs, I was able to trace the unique volume that has probably survived at the Houghton Library of Harvard University (call number *FC8.B6366.804m). It is a reproduction of this very rare document that is now in cyberspace. This is a great premiere for the Caribbean, and for Haiti in particular. 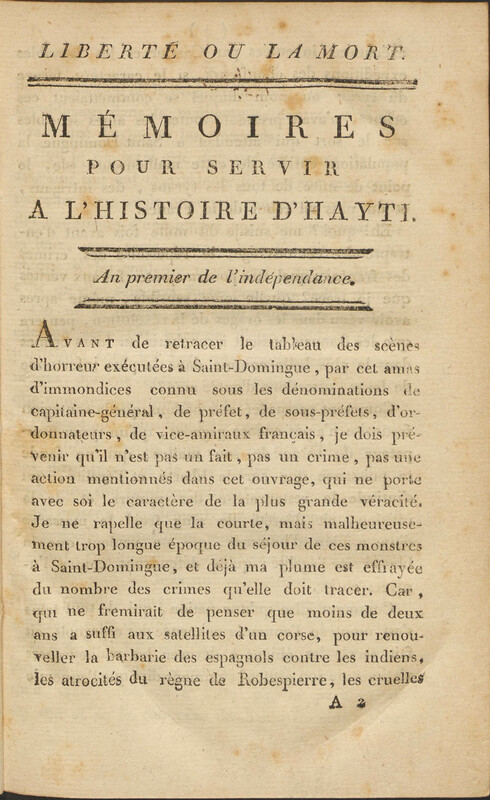 A Very Historic Moment in Caribbean Studies: Boisrond-Tonnerre’s Mémoires (1804) online. 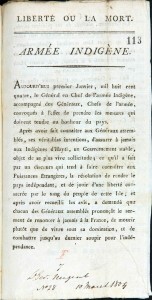 English translation of the opening and closing of the Mémoires. Congratulations Professor Jonassaint for your dedication and hard work in bringing this historic document to our attention. Kudos to you and Harvard University!